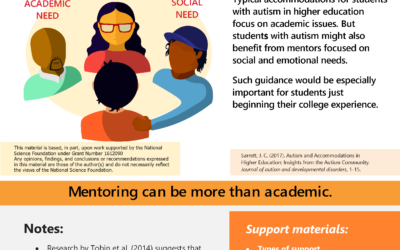 The College Autism Network supports research that informs evidence-backed insights that help facilitate college success for students with autism. 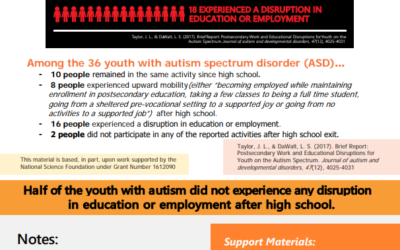 Fast Fact #5 – Half of the youth with Autism did not experience any disruption in education or employment after high school. * 10 people remained in the same activity since high school. 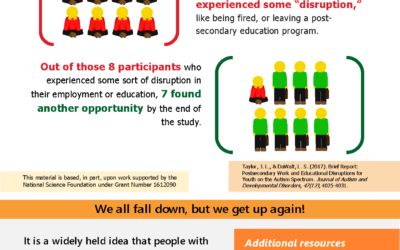 * 8 people experienced upward mobility (either “becoming employed while maintaining enrollment in postsecondary education, taking a few classes to being a full time student, going from a sheltered pre-vocational setting to a supported joy or going from no activities to a supported job”) after high school. 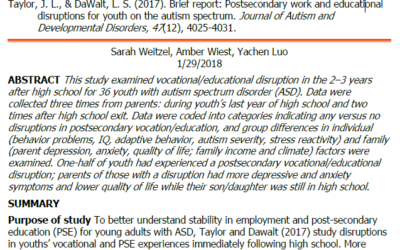 [Lit Review] The experience of anxiety in young adults with autism spectrum disorders. 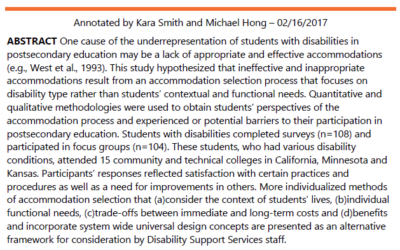 Taking required courses for postsecondary education and receiving high grades are important, but alone do not give a clear picture of whether students with disabilities will be successful in post-school academic or employment settings. Assessing non-academic skills related to employment and further education can complete this picture of skills students with disabilities will need after leaving high school. Click here to read more! To be successful in university courses, students with intellectual disabilities must have a set of collateral academic skills. Collateral academic skills refer to effective strategies that enable students to access course information and to meet the class requirements outside of course content. 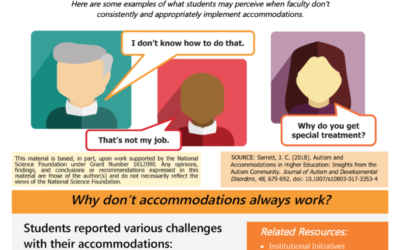 Overall students with intellectual disabilities have a hard time learning and generalizing new skills. 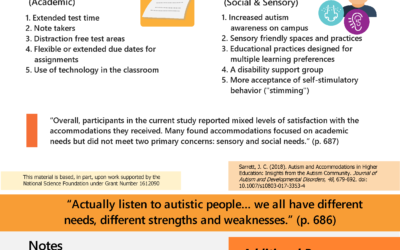 Systematic instruction and inclusion can help. Click this link to read the full annotation. In this study, the average participant rated their knowledge of AD “none to moderate,” and 2/3 indicated that they had to exposure to an individual with AD. Behavior among AD individuals elicited more stigmatization according to the Social Distance Scale than labeling. Additionally, no prior knowledge of behavior leads to stigmatization (not just behavior alone). Click here to read more. Out of 120 participants, the outcome was poor in 78% of the cases. In this very emotional and educational study, six of the participants had died at the time of follow-up, and six declined participation. Click this link to read more about the unbelievable statistics. 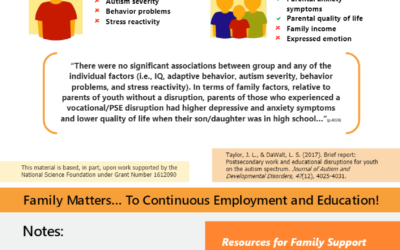 Parents and teachers may observe depressed mood, anxiety, heightened levels of inappropriate behavior, and victimization by peers in adolescents who have ASD… Overall, youth with ASD reported lower rates of self-determination and satisfaction than other youth with disabilities. Click this link to read the full annotation.